SIMFEROPOL, Crimea — Eight months into the Russian annexation of the Black Sea resort region of Crimea, traces of Ukraine’s 60-year rule here are rapidly being wiped away. 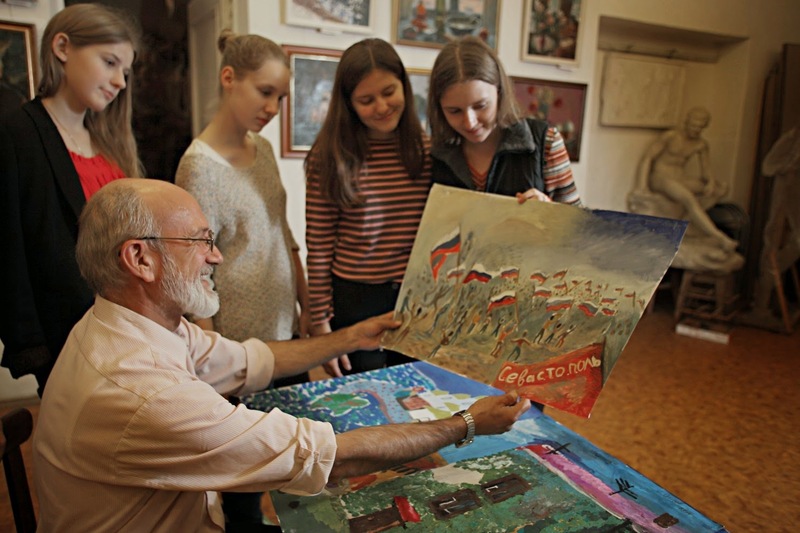 Alexandr Burtsev, a pro-Russian, and the head of a children’s art school in Sevastopol looks at one of his students' painting of the pro-Russian support meeting in Sevastopol. Now Ukrainians themselves worry that they are next. The Ukrainian language has vanished from school curriculums, Russia’s two-headed eagle has been bolted onto government buildings, and Russian laws are slowly taking hold. And as the peninsula Russifies, Ukrainians and other minority groups are finding that an area once renowned for its easygoing cosmopolitanism is now stifling. Some are fleeing their native home. Many complain that they have been written off both by the world and by Ukraine itself, which is focused on the bloody conflict in its southeast. The turmoil is a harsh consequence of the first major land grab in Europe since World War II — and it comes despite Kremlin assurances that life would be better in Crimea for Russians and Ukrainians alike. The Ukrainian Orthodox Church has quickly become a haven for Ukrainian-speakers in Crimea, who can gather on Sunday mornings to gossip and to send up prayers in sanctuaries whose authorities sit in Kiev, not Moscow. But Archbishop Kliment, the leader of the church here, fears for his future. “I get up worried and I go to bed worried,” he said, speaking in the converted school building in Simferopol that houses the church headquarters on this peninsula of 2.4 million. One poll taken when Crimea was still part of Ukraine found that about 12 percent of Crimean residents, or 280,000 people, identified as Ukrainian Orthodox. Since the Russian takeover, the church leader says, pressure has forced him to close almost a third of his congregations. Several of his priests have fled. Archbishop Kliment finds himself a world away from the heady days he spent in Kiev in February, when he announced onstage to a crowd of battle-scarred protesters that the Ukrainian Orthodox Church, which broke away from Russian Orthodoxy after the fall of the Soviet Union, had withdrawn its support for then-President Viktor Yanukovych. That provoked cheers from the crowd. Within days, Yanukovych was toppled — and Russia was moving in on Crimea. Russian President Vladi­mir Putin said he was acting to defend the rights of ethnic Russians, although the risks they purportedly faced appeared to be almost exclusively voiced within broadcasts by state-run Russian media. Many ethnic Russians were excited to join a richer nation that promised them a higher standard of living. In a March referendum, 97.6 percent were said to have voted to join Russia. Critics questioned the validity of the results, and opponents largely boycotted the voting. Now they say that an entire constellation of life is swiftly fading away. Some say they have no future in Crimea at all. Darya Karpenko emptied her Simferopol apartment and sold her Nissan this month, setting out last week with her 2-year-old daughter to join her husband in the Polish city of Krakow. Even though she is ethnically Russian, she said there is no future for her family in the city where she was born. “I feel almost like I’m jumping on the last train car that’s leaving,” Karpenko said, shortly before she left for Poland. Before the Russian annexation, Karpenko ran a popular blog and was a business consultant in Ukraine. Since the takeover, she said, she posts cautiously on her Facebook page, worrying constantly about Russian security services. “I’m expecting security services to come for me any time there is a spirited conversation” in the comments section of her Facebook profile, she said. Some of her friends were questioned when they criticized the annexation, she said. At least 25 of her friends and acquaintances have left, she said, leaving no one to talk to who sympathizes with her position in her final days in Crimea. “People are leaving every day,” she said. Ukrainian cellphone networks have pulled out, and suddenly friends and family in Ukraine are an expensive international phone call away. Businesses must follow new laws. Crimea’s new Moscow-backed authorities shut down the branches of several Ukrainian banks, and the others departed, leaving many people’s life savings in limbo. Ukrainian authorities have been reluctant to unlock money for new Russian banks that they say are part of an illegal occupation. Tourism, once a mainstay of the economy, has lagged as international tourists stayed away this year. And agriculture suffered when Ukraine cut back the amount of water it sends to Crimea via a canal. Life could become even more complicated in the coming months. Russia will require that residents have Russian passports to qualify for health care, which will force some of the last holdouts either to give up their Ukrainian passports or to leave the peninsula. Ukraine, meanwhile, is imposing restrictions on the amount of cash that Crimean residents can carry across the border. But many Crimeans are happy to be part of Russia, even if the initial euphoria has dissipated. Some welcome once again being part of a Russian nation to which they always felt connected. Others hold out hope for new economic opportunities. Many say that if it weren’t for Russia’s intervention, they would have had the same bloody experience as eastern Ukraine — although that conflict was sparked by pro-Russian separatists seizing local government buildings, not by the central government in Kiev. “We felt we had been in internal immigration. I am a Russian person,” said Alexander Burtsev, the director of a children’s art school in Sevastopol, the port city that is home to Russia’s Black Sea Fleet. “Our lives have become better,” he said. Those who complain about the transition period, Burtsev said, are simply being impatient. “Times aren’t easy, because we’re switching from Ukraine to Russian legislation. But it’s a temporary problem,” he said. Authorities say they will smooth out the bumps that have accompanied the peninsula’s switch to Russian rule. They say that there is room for minorities to live in Crimea so long as they live within Russian laws. “Ukraine has been an angry stepmother for Crimea,” Crimean Prime Minister Sergei Aksyonov, the top Russian official in Crimea, said in written replies to questions. “To make Crimea self-sufficient is our strategic aim. We plan to reach this goal in five years,” and Moscow has pledged $15.5 billion to help do so, he said. As for the Ukrainian Orthodox Church, he said that no other churches recognize it. Its future appears to rest on whether it is allowed to register in Russia, an unclear prospect. Archbishop Kliment says he will fight as long as he can. “Until the last Ukrainian leaves Crimea, we need to be here with them,” he said.